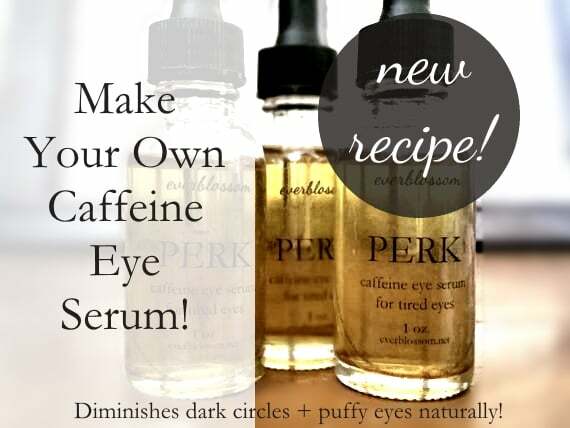 Tired Eyes Remedy – New + Improved Caffiene Eye Serum Recipe! My caffeine eye serum recipe has been shared and tested like crazy and it's been interesting to see the response. Some of you absolutely love it, while some of you have had disappointing results. Here's what we've learned, dears! The way the serum turns out varies drastically depending on the type of coffee used. If you don't strain it enough, you'll end up with coffee dust in your serum, which marks your skin and defeats the entire purpose of the serum! Mountain Rose Herbs has both. You can substitute other carrier oils based on what you have around. Here's a guide to carrier oils that will help you choose. ALL YOU HAVE TO DO IS combine the ingredients in a bottle. A glass bottle with a dropper is nice. A roll-tip bottle with a steel ball would help the serum work better, too. Boom. Use a drop or two under each eye on those early mornings. Coffee EO has caffeine! Applied topically, caffeine improves circulation and reduces inflammation. This is what makes the serum so effective. Vanilla EO delivers an extra dose of antioxidants to slow aging and protect your skin. Avocado oil is deeply nourishing an moisturizing – perfect for that delicate skin around the eyes. Sweet almond oil is a readily-absorbed carrier oil that helps the other ingredients reach the layers of your skin. I can't wait to hear how you all like this recipe – it's an improvement on an already awesome one, in my mind! If you want to try it before you DIY it, this exact serum is listed in my shop as PERK. Oh well just finished making your original Caffeine Eye Serum recipe!! I’ll give it try and see how it works! Maybe I’ll try the new one next time! Let me know what you think, Patti! Just made this new and improved recipe! I’m super excited and I’ll let you know how it works! Can’t wait to give this a go, I’m all for anything on my skin being 100% natural, plus I’m staring down the barrell of 50 so I could do with some extra help around my eyes. You’re gonna love it, Susie! How many mls do you put in the bottle, and also how long is the shelf life of this? Hi! I love this recipe but I’m wondering about the caffeine in coffee essential oil-I had heard that through distillation it looses it’s caffeine. I’m really hoping I got this wrong!! Can you point me in the right direction where you found this info.? I have a blog too and my readers have asked me this many times-I’ve never found the info. I’m looking for!! Caffeine is both water and fat soluble so I’m not sure where that idea would come from. In any event, the serum is really effective and the coffee EO bottle actually says to avoid use if you’re sensitive to caffeine. Let me know what you think if you try it out! OK so I have searched everywhere but cannot find any further info. Was helping you guys could help me. I LOVE espresso coffee and decided to make an infused oil with “espresso” beans instead of “coffee” beans. I used almond oil and ground espresso beans, stored in air tight bottle and let it sit for a little over 2 weeks. Strained it and it turned out smooth & dark creating an “espresso” infused oil. The Internet doesn’t have any info and neither does any of my EO books. I noticed on your blog that lighter roast would create a higher caffeine content…how would that compare to espresso? Espresso is high in caffeine already but wanted to get some feedback about putting the oil in mixture for an eye serum. Has anyone ever experimented with “espresso” infused oil? Used in any skin care products? I would still use it, perhaps diluting it with a bit more avocado oil if it seemed really strong. What would your recommend for someone allergic to sweet amond oil or botanical fragrances? I love your attitude and open-ness as well as the way you embrace other people’s suggestions…. I used your old “recipe” for this and used black coffee grinds but I let it sit for a shorter amount of time is that ok? Thanks for posting Kylie! Does the serum reduce under eye circles immediately upon first use or do they fade gradually over time with use? I have been using for about a week now and have not noticed any effect. I made the recipe exactly as stated and use Plant Therapy’s coffee EO! Appreciate your feedback! Hello from Greece! I’m about to make the recipe, except I don’t have the specific EOs. Any substitutes fit for the eye area? I’m not aware of any others that contain caffeine. I’m obsessed with this, and I love it! I use it almost every morning and it helps my tired puffy eyes! Thank you so much!!! Super moisturizing + great antiaging properties. You can certainly substitute another carrier oil of your choice.